What happens when an all-black soberness is softened by a fireplace. This is the core concept behind the restoration of a two-floor apartment near the walls of Treviso. The space was formerly broken up into living area and two rooms, kitchen and bathroom. Architect Adriano Marangon, together with his colleague Michela De Poli, worked to open up these spaces, playing with the ample outward-looking windows, and using large sheets of glass instead of walls to separate the various functional zones. A custom-designed bookcase, with irregular, asymmetrical shelving, lines the walls. In the middle, a large rectangular block – which features closed storage units and illuminated open shelving – incorporates the warm heart of the house. 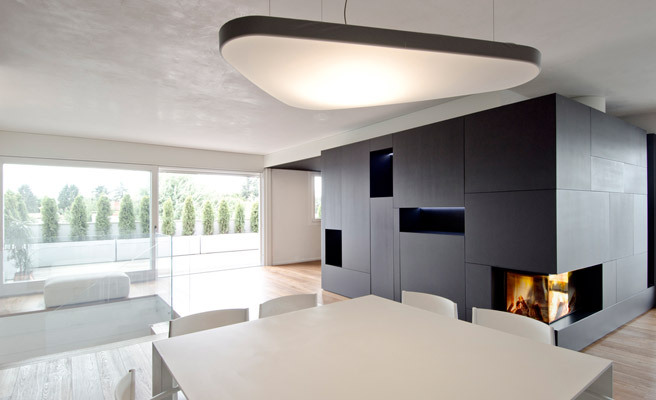 This corner fireplace is just the thing to lend warmth and light to its all-black surroundings (model Forma 75dx). The fire-wood unit fitted in the corner adds an extra touch of warm colour, breaking the uniformity of the central block. Interior design studio MADE associati from Treviso was founded in 2001 and deals with di urban planning, landscape architecture, architectural design, interior design. The partners, Michela De Poli and Adriano Marangon, attended conferences, exhibitions, seminars and workshops. They received numerous prizes and awards in national and international competitions. They have been visiting professors in Italian and foreign universities.